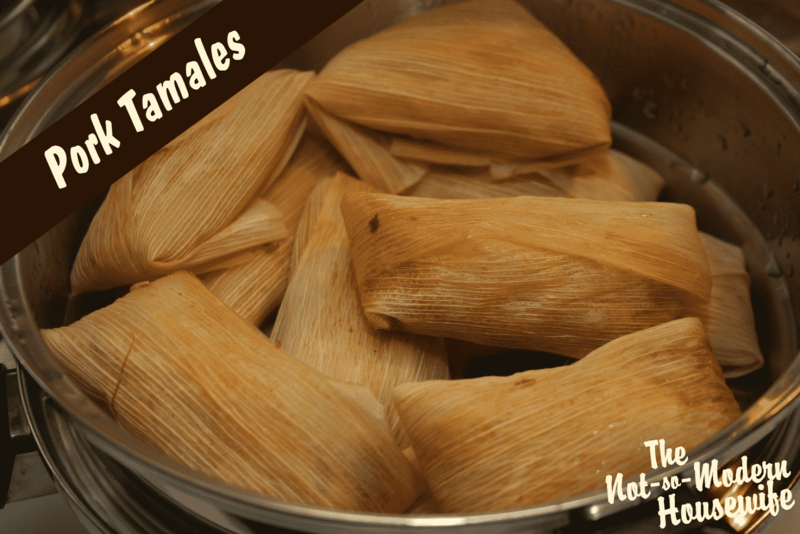 Tamales are a popular dish in many Hispanic households around Christmas time. They can be a lot of work, especially if making a larger batch, so often the whole family would get involved in the cooking process. The whole process is rather time consuming. You can save time by cooking the pork a day ahead of time. You could also set the slow cooker in the morning before you go to work and have pork ready to shred by the time you get home. I made extra pork and we served it with yellow rice. The chili sauce makes it really flavorful. Season pork with salt and pepper. Place the pork in the crock pot with the onion and garlic. Put water in the crock pot so it comes about half way up the pork. Simmer on low for 8-10 hours. Remove the pork from the cooking liquid. Shred the pork and set aside. Remove the seeds and stems from the chilies. Place in a small sauce pan with water and simmer uncovered for 20 minutes. Remove from heat and cool. Pour chilies and water into the blender with salt and puree until smooth. Mix 1 cup of chili sauce into the shredded pork. Reserve the rest of the sauce for serving. Soak the corn husks in a bowl of warm water to soften. In a large bowl, beat the lard with the beef broth until fluffy. In a separate bowl, combine the mesa harina, baking powder and salt. Mix into the lard until well combined. Add more broth if necessary to get the dough to stick together. Lay out a moistened corn husk and spoon about 2 Tbsp of dough into the center. Press out the dough to the sides of the corn husk until it is about 1/4″ thick. The dough should go to the sides of the corn husk, but leave about an inch of space between the dough and tops and bottoms of the corn husk. Place about 1 Tbsp of shredded pork in the center of the dough. Roll up the tamale by first rolling the sides of the corn husk to the center. Then fold the tops and bottom of the corn husk back. Do not pull on the corn husk too much as this will cause it to rip. If you do rip a whole in the husk, wrap with a second husk. Repeat the process until you use up all of the dough and/or filling. Place the tamales in the top of a steamer pan. Steam for 1 hour. 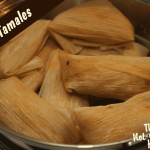 To serve, unroll the tamales from the corn husks and serve hot with sour cream and chili sauce. Lay out a moistened corn husk and spoon about 2 Tbsp of dough into the center. Press out the dough to the sides of the corn husk until it is about 1/4" thick. The dough should go to the sides of the corn husk, but leave about an inch of space between the dough and tops and bottoms of the corn husk. Place about 1 Tbsp of shredded pork in the center of the dough. If you cannot find corn husks, I have wrapped my tamales in parchment paper.